There are 7 awards: To find out about the criteria for each award, please click here. The Lifetime Achievement Award is presented at the discretion of the Sports Forum Chairman. Mikey has thrown himself into the sport and, after winning medals in the Invictus Games, then reaching a ranking of fourth in the world, he was selected to represent GB in the compound bow archery competition at the Rio Paralympics in September 2016 where he achieved 7th place. Mikey gave a short speech of thanks and received a loud round of applause. The Sports Forum is delighted that Mikey could fit in the Awards Evening between competitions in the Caribbean and Loughborough! 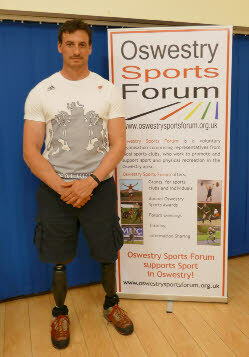 Contribution to Sport went to Dave Newton, who has been an active member of Oswestry Olympians for over 15 years. Dave helps with coaching, setting up races, running the Olympians’ activities for the Oswestry Community Games and managing the Olympians annual presentation Evening, calculating performance records and the complex handicap system. The Chairman’s Award for Lifetime Achievement . The Lifetime Achievement Award is presented at the discretion of the Oswestry Sports Forum Chairman. 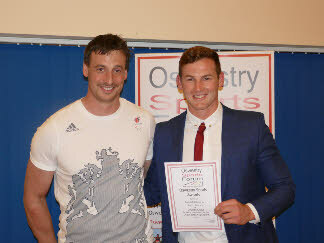 Chris Powell, completing his third and final year as OSF Chairman, presented the Award to Don Howell, Chairman of Oswestry Rugby Club. As a youngster, Don was introduced to Rugby by the late Nigel Keighley and has been dedicated to the club ever since. After playing for the club for many years, with his name on the “Captains” board five times, Don became coach to the first team and to the Juniors. He has been heavily involved in developing the Juniors wing of the club and has taken various Committee posts. In his third year as Chairman, Don has overseen the major redesign and refurbishment of the club house. As well as his commitments to the Rugby Club, Don has been closely involved with Oswestry Sports Forum, serving as Chairman and a long-standing, active member of the Grants Committee. Don is a sporting champion with a big impact on local sport. Unfortunately, Don was not able to attend. The Committee of Oswestry Sports Forum would like to thank Oswestry Cricket Club for their generous hospitality and for everyone who attended the Awards Evening. We were delighted to share the celebration with about 80 members, families and friends. We would also like to thank Shropshire Paddlesport for providing the ergo challenge, Nick Beighton for being our Guest Speaker and Hazel Yates for organising the Hall of Fame. Coach of the Year was won by Yvonne Edwards, who has been a key volunteer with Oswestry Otters for 13 years. Yvonne has been Head Coach, Club Secretary, has achieved the Level 3 Coaching qualification and has remained positive and a friend to everyone throughout. She has recently taken on the Get Wet Swimming Scheme in St Martins where local children can learn to swim and progress to Oswestry Otters when they are ready. Yvonne could not attend on the night. Her daughter, Chloe, accepted the Award on her behalf. 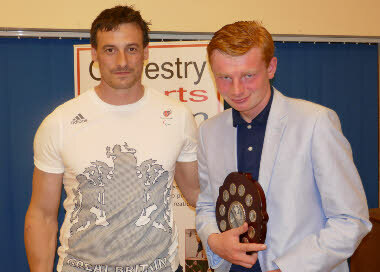 The Junior Team Award was won by Oswestry School’s Under-18 Football Team, coached by Alun Morris. 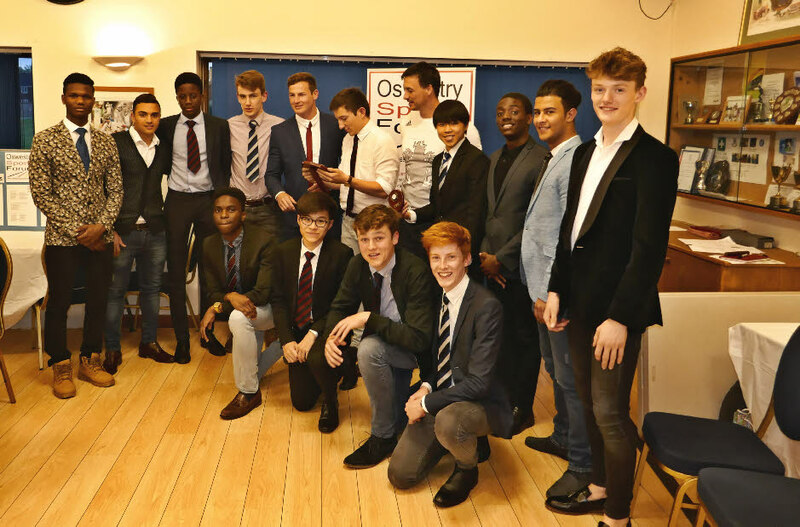 This has been the most successful season for Oswestry School since it was founded in 1407! Team members have played two full terms of football, with two training sessions and two fixtures every week. They won the Shropshire Schools and Colleges League and reached the semis in the Shropshire Schools Cup as well as in an international competition, the Las Vegas Major’s Cup. 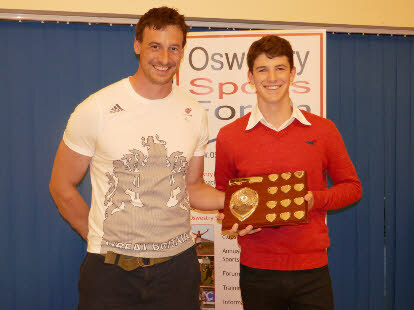 The Outstanding Achievement Award was won this year by Oswestry Otters’ Morgan Jones (last year’s runner up!). Morgan has continued to develop as a swimmer, coach and club role model. He has been selected to attend a Youth Commonwealth Games training camp, with the possibility of being selected for the Youth Commonwealth Games. He has won a host of Gold medals e.g. at Regional and Welsh National championships. was selected to join the England U-16 Cricket Team tour to Sri Lanka. 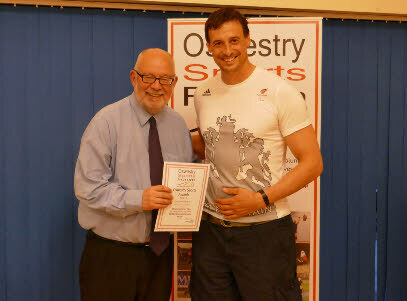 Xavie could not attend the Awards Evening due to training commitments but Nick Beighton presented the Certificate to OCC Chairman, Mike Robinson on Xavie’s behalf. 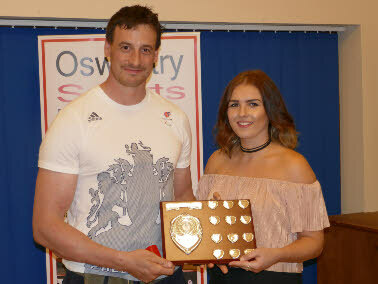 There was a full house on Friday night for the annual Oswestry Sports Awards, organised by Oswestry Sports Forum. 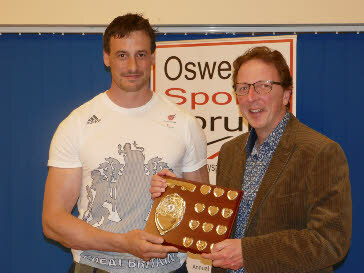 The first honour was to induct Mikey Hall into the Oswestry Sporting Hall of Fame. Oswestry Sports Forum Chairman, Chris Powell, read out the citation which will be displayed amongst the other Hall of Fame Heroes, along the gallery in Oswestry Leisure Centre. The Hall of Fame was started as a Legacy Project of the 2012 Oslympics. Hazel Yates, of Oswestry Rotary Club, has written all the citations and was present on Friday night, to welcome Mikey into the Hall of Fame. Mikey suffered a life changing injury while serving in the Army but has picked himself up and discovered a talent for Archery. 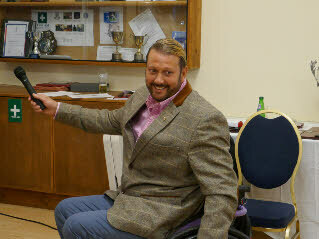 Oswestry Sports Forum Chairman, Chris Powell then read the nominations for the annual awards. for it with no excuses and no giving up – but to enjoy the process, enjoy the friends made on the way and always remember to prioritise what is really important in life. He also allowed members of the audience to hold and try on his Paralympic medal. Although only 16, Morgan had to compete in the 17 and over (open age group) category in this year’s Welsh Nationals where he still achieved four medals, two Gold, and 11 PBs. 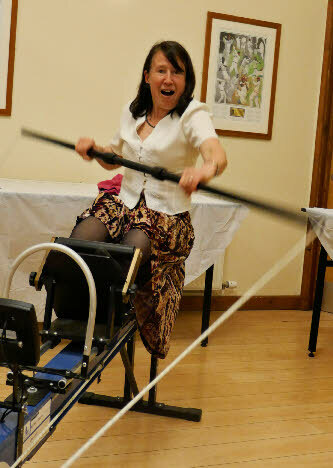 The evening finished with an ergo challenge provided by Shropshire Paddlesport. 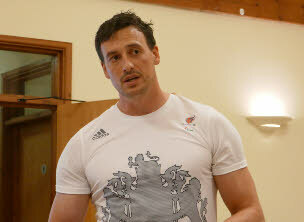 Attendees tried to beat Nick Beighton’s 200m sprint time. Nick achieved 44 seconds in the Rio Paralympics. The ergo times should be faster, due to lack of water-resistance, and Nick completed the ergo challenge in 36 seconds (including a pause when the cables got tangled)! It was harder than it looked (especially for Susie - see photo!) and even the young Otters could not get near that, the nearest challenger doing about 47 seconds.